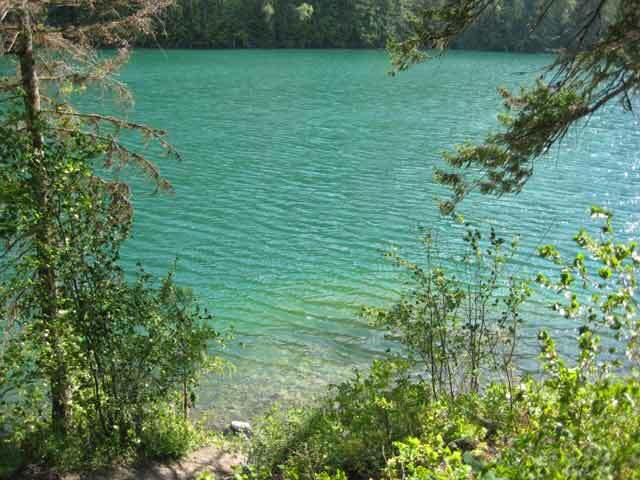 Echo Lake Provincial Park is located 20 km (12.5 miles) south-east from the small community of Lumby and about 19 km (12 miles) south-west of Cherryville. 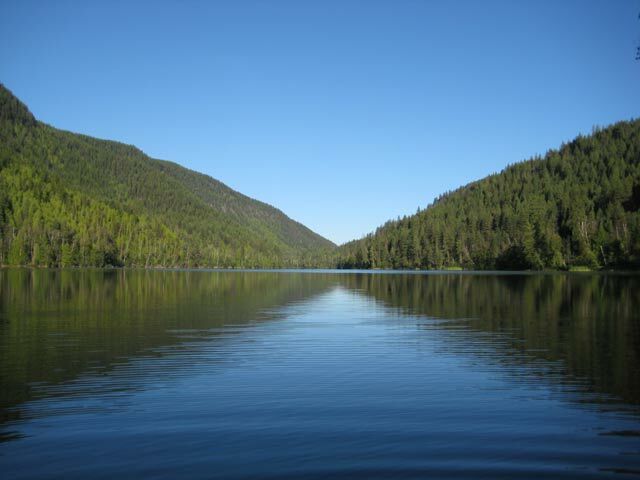 The main highlight of Echo Lake Provincial Park is the close proximity to the beautiful Monashee Mountains and the beautiful crystal clear emerald green Echo Lake. Echo Lake Provincial Park is very serene, quiet and a great place to go swimming or canoeing especially during the hot Okanagan summer. The lake features great fishing along with an abundance of wildlife viewing opportunities. To get here from Vernon take Hwy 6, 6 km (3.75) east to Lumby. When you are just past Lumby turn south onto Creighton Valley Road and travel approximately 20 km (12.5 miles) to Echo Lake Provincial Park. If you are coming west on Hwy 6 from Needles travel about 74 km (46 miles) to Cherryville. As you travel past the Gold Panner Campground look for the Creighton Valley Road and then go approximately 11 km (7 miles) to Echo Lake. The facilities located at Echo Lake are basically nil and the only real evidence is a sign on Creighton Valley Road. Unfortunately at one time there was a small campground here but because of vandalism in the past it had to be closed. If you do some exploring there are some remains of the old campsite including the wharf situated on the south-west side of the lake. If you would like to camp there is the privately owned Echo Lake Fishing Resort located towards the eastern end of the lake. 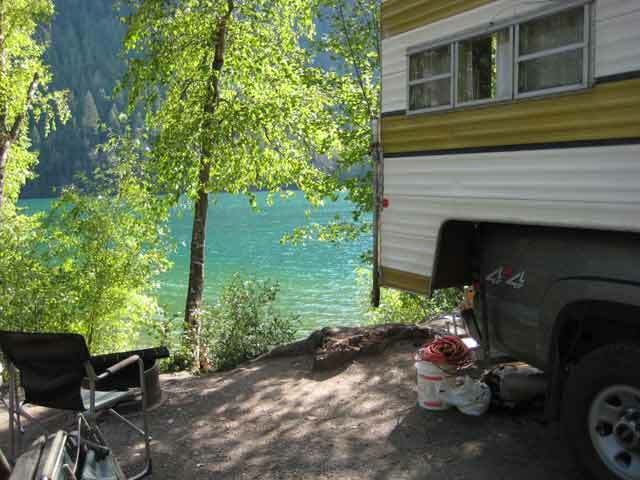 Echo Lake Fishing Resort features 35 campsites, some situated next to the lake available with power, as well as cabins, boat rentals, launch and a small store complete with fishing gear and expert advice on what the Rainbow, Kokanee and Lake Trout are feeding on. Besides the Echo Lake Resort there is also the privately owned Cozy Cabins situated on Creighton Valley Road very close to the west boundary of Echo Lake Provincial Park. Cozy Cabins offers small log cabins nestled in a relaxed forest setting very close to Echo Lake. Just remember if you are enjoying the provincial parks and the countryside around British Columbia, please remember this is Bear Country. Try to avoid the rivers during heavy salmon spawning times unless you feel comfortable with bears around and take the usual precautions. There is also the possibilities of encounters with wolves or cougars so please play it safe.